Emily Bett Rickards Stephen Amell. “The only thing that Emily has ever told me to do, is give me explicit instructions not to introduce her to Topher Grace.” “And then he did, and I looked like an idiot.”. Wallpaper and background images in the Stephen Amell & Emily Bett Rickards club tagged: smile19 stemily stephen amell emily bett rickards walker stalker con 2014. 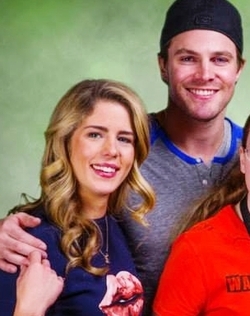 This Stephen Amell & Emily Bett Rickards photo might contain retrato, tiro en la cabeza, primer, headshot, primer plano, en la cabeza, and closeup.